What is economic growth? We all think we know the answer to this question. It’s when GDP (Gross Domestic Product) is growing or positive, would be a typical answer. That is an abstract answer for most of us. We tend to focus more on the likely results of a growing economy, such as there are more high paying, high quality jobs; you are more likely to receive a raise above the inflation rate; you are more likely to have more money in your bank account; your access to education, health care, quality of food, etc. generally increase. But if population growth is 5% and GDP growth is only 2% then none of these good things happen. What we are interested in is real per capita increases in wealth. But what is wealth? Is it the number of digits in your bank account, how many dollars you have in your pocket, how many dollars your 401K is worth? The people in Venezuela have seen a huge increase in the number of digits in their bank accounts, and the number of dollars (Bolivars) in their pockets have increased, however they are getting poorer. So did the people in the Weirmar Republic in the early 1920s, many of whom were billionaires (in Marks). Wealth cannot be confused with the amount of currency (Dollars, Bolivars, Marks) one has. Using currencies to denote wealth often causes confusion. Let’s look at some examples separate from currency. Image a farmer, we’ll call him Tony. Tony has two cows, a dirt house with a thatch roof and no running water or electricity. A year later Tony has ten cows and running water. Clearly Tony is now wealthier than he was a year ago. In fact, the quantity of livestock one owns has been a traditional indicator of wealth in many societies. Wealth means having more of the things necessary to sustain one’s life. But people in the US and the West are not like Tony, most of these people have more than they could possible need to sustain their life –right? Actually, no. A rational person, let’s call him Randy, does not just worry about whether they have enough food for today. Randy’s a fisherman and just because he catches enough fish to feed his family today, does not mean he should stop fishing. What if the fish are not biting tomorrow? What if there is a storm tomorrow and he cannot fish? What if his boat needs repairs and he cannot fish for a week? Because Randy is rational he keeps fishing even after he has caught enough fish to feed his family that day, if there are fish to be caught and the day is not over. But the average American, call him Sam, is not like Tony or Randy. Sam has so much to eat he is overweight. He is wealthy beyond the wildest dreams of Tony or Randy. He lives in a nice house, has running water, electricity, three televisions, five cell phones, why should Sam care about being wealthier? Well what if Sam gets sick and can’t work, what if he loses his job, what if his car breaks down, what if his child gets accepted to Harvard? Only the uber wealthy have enough wealth to meet all their needs for the rest of their lives. When you consider that a prolonged hospital stay can cost over million dollars, it would require a net worth in today’s economy of around ten million dollars or more. All except the uber wealthy have a rational desire for economic growth (i.e., increasing wealth) and even the uber wealthy benefit from the new technologies and opportunities provided by economic growth. 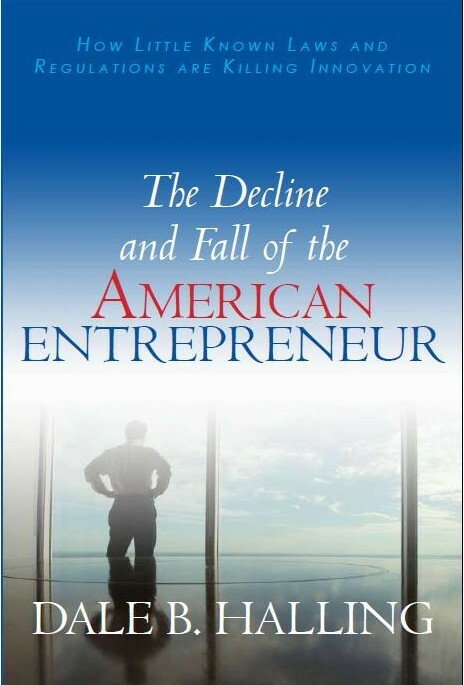 It has been two year since I published my book The Decline and Fall of the American Entrepreneur: How Little Know Laws and Regulations are Killing Innovation. The book explains that the only way to increase real per capita income is by increasing our level of technology. This can be accomplished by capital equipment purchases, which upgrade plant and equipment with newer technologies or by creation of inventions. Since the United States is a leader in technology, we do not have the choice of just upgrading to new technologies produced in another country. So we must create new technologies if we want our economy to grow. There are two ways to encourage the creation of new technologies; government funding or private investment in inventions. Government spending on research and development is not nearly as effective as private spending – see Solyndra. A study by the Small Business Administration shows that most emerging technologies are invented by small entrepreneurial start-ups. Unfortunately, since 2000 the U.S. has undermined the three foundations on which technology start-ups are based. Those three foundations are intellectual capital, financial capital, and human capital. We weakened the intellectual capital foundation by weakening our patent system, we weakened the financial capital foundation with the passage of Sarbanes Oxley, and the human capital foundation was weakened by the accounting rules that required the expensing of stock options. Since my book was published the intellectual capital foundation has been undermined this year by the passage of the America Invents Act and the financial capital foundation has been undermined by the passage of the financial reform bill (Dodd Frank). There has been no change on the human capital front. There is mixed news on the intellectual capital front. These problems are being exacerbated by the budgetary issues associated with aging baby boomers. The Obama and Bush administrations compounded these problems by expanding Medicare to prescription drugs and the passage of Obama Care. In 2010, Medicare/Medicaid and the Children’s Health Insurance Program (CHIP) represent 21 percent of the federal budget. Social Security represents about 20 percent of the federal budget and interest payments represent about 8 percent of the federal budget. It is estimated that about 10,000 baby boomers will go on Medicare per day for the next twenty years. However, about 5000 seniors are dying per day. Each Medicare recipient costs about $10,500, so Medicare costs will expand by $185 billion dollars (today’s dollars) or another 5% of the federal budget. Roughly, the same calculation applies to social security. So Medicare and Social Security will consume approximately 50% of the U.S. federal budget by 2020. In addition, the interest payments are likely to consume around 30% of the U.S. federal budget. This means that 80% of the federal budget will be spoken for. This does not include any additional costs for Obama Care. It is unlikely that the federal budget as a percentage of the economy can grow, since the U.S. had to borrow one third of the federal budget in 2010. One change from last year is that all the Republican candidates have come out for repealing or curtailing Sarbanes Oxley and the Financial Reform Bill. There may be hope that entrepreneurial companies will no longer be starved for financial capital if the Republican’s win the presidency. It appears unlikely we will strengthen property rights for inventions or property rights generally or signficantly strengthen our capital markets so they work for start-up companies, the most optimist scenario is limited to subpar growth. The housing market is likely to be stagnant since family incomes will be stagnant. Inflation is likely to run 4-6% (Note that it appears that government is determined to lie about the inflation numbers, so it will be hard to determine the real inflation rate), but this will not be enough to cause appreciation in housing prices. In fact, inflation adjusted housing prices will likely decline. The best reason to be more optimistic is that the U.S. has never had two bad decades in a row. In the late 1930s and late 1970s there was no reason to suppose that the U.S. would right itself economically. We pulled out the 1930s because Roosevelt realized that he had to adopt pro-business policies if the U.S. was to have any chance of winning World War II and so did the voters. In the 70s, there was little hope that the U.S., let alone England, would pull out of the inflationary spiral, increasing unionization, increased regulation, increasing government spending and entitlements. However, there was the glimmer of Ronald Reagan and a surge of free market economists such as Milton Friedman, who still understood property rights. Unfortunately, I do not see a Ronald Reagan on the horizon and many of today’s free market economists are overly focused on the detrimental effects of Federal Reserve and high marginal tax rates. Very few seem to understand the importance of strengthening property rights, particularly for inventions or the need to free up our capital markets from regulation. I hope I am wrong and there is a politician who understands property rights, particularly for inventions, and the need to free up our capital markets, while having the strength to stand up to government unions and special interests. In other words, there is a strong correlation between the strength of property rights in general with the strength of a patent system in a country. This should not be surprising since patents are property rights in inventions. If you did a study of arbitrary government grants or monopolies versus the strength of patents in countries, you would find they are highly uncorrelated. Despite the nonsense that suggests that patents are monopolies. Among 15 Western countries over several centuries, enactment of patent law was associated with higher rates of scientific discoveries, inventions, and innovations. Lemley’s argument that great inventions are created by multiple people simultaneously has been examined by numerous scholars and found to be incorrect. For instance, see Jacob Schmookler and his ground breaking book, Invention and Economic Growth, which examined this issue. People like Lemley attempt to smear together multiple inventions as being the same invention. For instance, they see Swan’s light bulb and Edison’s light bulb as simultaneous inventions of the light bulb. Lemley may have made this mistake because he does not have the technical background necessary to understand the issues surrounding the invention of the light bulb. However, I suspect that Lemley is not interested in the truth, he is interested in pushing a political theory of collectivist invention. If Lemley’s ideas held any water at all, then you would expect either: 1) the USSR/North Korea should have been one of the greatest sources of inventions in the history of the World, and/or 2) the greatest population centers would be the biggest creators of new technology. The facts are that neither are true. The first is self evident. The second appears to be true until the creation of property rights for inventions. When England and the U.S. create an effective property rights system for inventors almost all significant inventions for the Industrial Revolution are invented in the U.S. and England, even though their populations are much smaller than France, China, India, etc. Lemley is pushing an old worn out socialist idea that individuals do not matter only the collective. This paper is not novel and its thesis has been proven false over and over again. But socialists do not believe in an objective reality. The paper is an example of the intellectual and moral bankruptcy of many of our academic institutions.